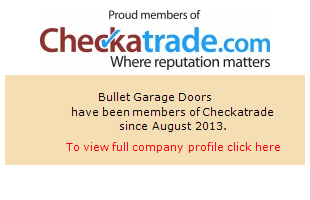 Bullet Garage Doors is a family-run company that have been serving customers throughout the Luton area for over 15 years. We specialise in supplying and installing garage doors for a range of domestic properties throughout Bedfordshire and the surrounding areas. We’re also vastly experienced in providing garage door repairs. As we’re located in Dunstable, we’re ideally situated to serve customers in Luton, lying just fifteen minutes away via the A5. We have a wide range of garage doors on offer to suit all tastes and requirements. Choose from a variety of materials, including timber and steel, and from our range of designs, including automatic, roller shutter, and sectional garage doors. All of our workers are more than happy to chat with you about the various benefits of each style, and can offer insightful, impartial advice about the types of garage door that would be best suited for you and your property. Our work doesn’t stop after we leave your home, either; if there’s anything wrong with your new garage door after we’ve installed it, we'll come back out and take a look. Customer service is at the heart of everything we do. We always strive to go the extra mile for our customers in whatever way we can. We don't like saying “no”, and we firmly believe that where there's a will, there's a way! It's this positive attitude that has kept us in business over the past fifteen years, with a lot of our customers coming to us after word-of-mouth recommendations. Our team are all fully qualified and vastly experienced in carrying out garage door installations, paying meticulous attention to detail to ensure that nothing goes wrong. If your garage door is stuck or damaged, but you don’t want or need a replacement, Bullet Garage Doors can help. We have a great track record when it comes to garage door repairs, and are happy to help whether or not we installed your door ourselves. We'll come out to your property to inspect the situation for just a small call out fee, and give a free, no-obligation quote for the repairs. We always strive to complete the work as quickly and efficiently as possible, keeping any minor disruptions to a minimum. If it so happens that we require a part, we’ll always leave your property in a safe state while we wait. For more information about our garage doors, or our garage door repairs, get in touch with a member of our team today. You can call us on 01582 932025 or contact us via our online contact form. If you’d like any more convincing that we’re the best company for the job, you can also take a look at our testimonials page.